On November 27, 2017 fifteen of the State’s top technologists, non-profit and municipal community leaders, and academic scholars set off to collaborate and create a high-level design of three (3) next generation software solutions that would enable individuals with little or no computer skills to participate in accessing public services on the internet. We were there to address quality of life issues like education, healthcare and workforce development. Dennis Newman, Program Manager for NCNGN ambitiously set the goal for the day: Design three apps that address how to provide accessible digital services to the disadvantaged members of the community that experience being excluded because of digital literacy, demographic exclusivity and economic inequality to increasing the capability and impact of Durham’s public services. NCNGN partnered with two organizations to make this all happen. US IGNITE and the City of Durham. The workshop was focused on developing consensus for the “functional application build-out”. The leadership teams were to assume users had 1) access to services at neighborhood community centers, and 2) that the solution would not work without high-speed internet. 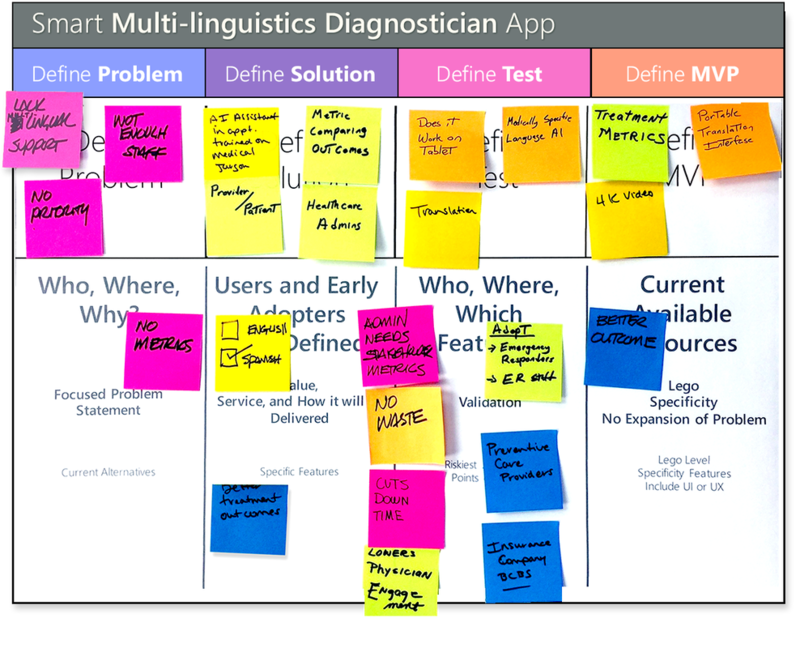 It utilized a development framework consisting of a modified hybrid of three popular sprint methods: Lean Startup, Business Model Canvas, and Design Sprint. After a warm and inspiring welcome from Ms. Wanda Page, Durham’s Deputy City Manager, and then a high-level overview of NCNGNs work and todays workshop’s goals and objectives from Dennis Newman – Joel Bennett took the group through a thirty-minute narrative and scenic tour into the world of innovation, lean startup, design sprints, minimum viable products, problem/solution definitions, and the importance of testing the riskiest assumptions first. The goal of a lean startup is to build, measure and learn. Prior to our workshop the group preselected three problems areas they identified as being valuable public services in need by the digitally disadvantaged: Education, Health Services, and Employment. ...and then present them to the group. People of color can’t get a job due to criminal backgrounds, lack of skills and lack of centralized resources. Identify agencies interested in supporting initiative such as local test groups, and TROSA. What to bring: Uniforms, Safety Shoes, Lunch, ID Card, etc..
Parents are disconnected from their children’s educational experiences. 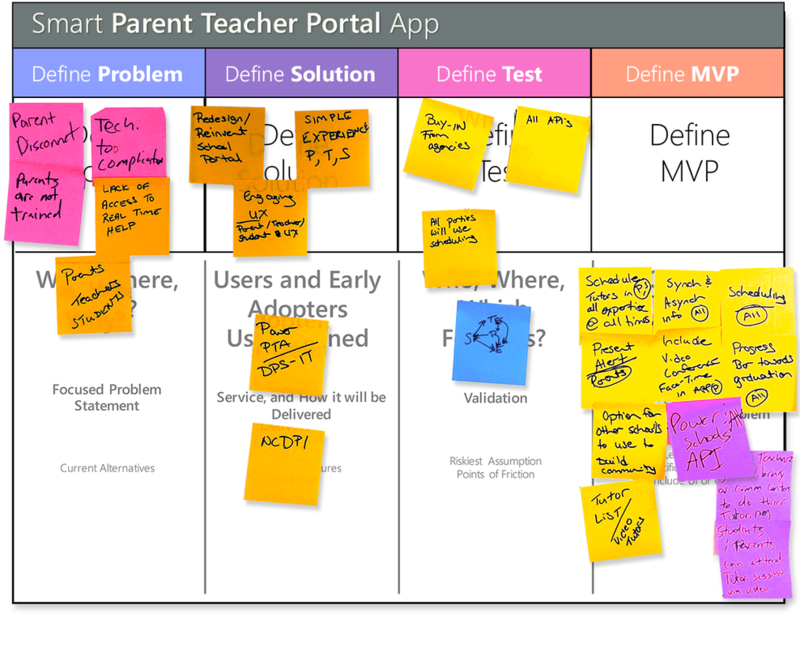 The UI/UX technology of the current parent/teacher portal is too complicated for parents to learn, navigate and creates a barrier to entry that results in a lack of awareness of problems. Students have no real-time access for help. Redesign School Portals that provide a simple and engaging user experience and universal access for parents, teachers and students. Identify agencies interested in supporting initiative such as local Power PTA, and NCDPI. A lack of bilingual support at healthcare facilities creates a barrier for adequate service. Not enough bilingual staffing and training is the result of organizational prioritizing. An Artificial Intelligence (AI) assistant in appropriately trained medical jargon. Providing healthcare administrators the metrics and KPIs comparing outcomes of providers and patients. Prove it works on a tablet, medical support and defined set of nomenclature for natural language AI and translation.